Cruising through Paris on the Seine River is undoubtedly one of the most atmospheric and romantic ways to soak in the city’s striking beauty, historic architecture, and famous monuments. Here are your options when it comes to cruising the Seine. Relax as you take in the sights at a leisurely pace. Gain a unique point of view as you see the Champs de Mars, Les Invalides, Notre Dame Cathedral, Pont Neuf, and more from the water. Cruises generally last between one and three hours. Many river cruises offer lunch, dinner, or champagne on board. See Paris from the water with a hop-on, hop-off pass that allows you sightseeing boat access for up to two days. Stations along the riverbanks are convenient stops for the Eiffel Tower, the Musée d’Orsay, Saint-Germain-des-Prés, and more. 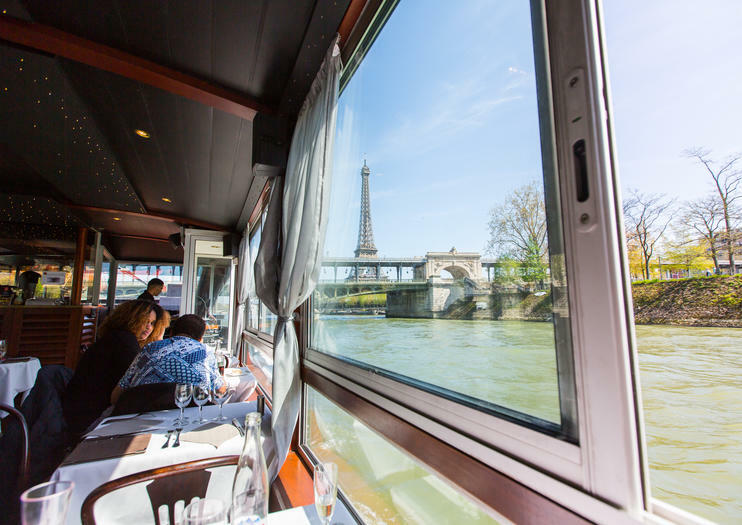 Many Seine River cruises offer classic French dining on board, whether as a brunch, lunch, or dinner experience. Choose a tour that offers a gourmet three-course menu, or one that includes samples of local wines and champagne while you take in the sights. Do more in one day with a combo experience that includes an activity on land before or after your cruise. Popular things to pair with a cruise are skipping the line at the Eiffel Tower, enjoying a cabaret show at the Moulin Rouge, and sightseeing on land by hop-on, hop-off bus. When you don’t have oodles of time in the French capital, make the most of it with a trip to Versailles and a tour of the best of Paris in one day. Spend the morning at the extravagant Palace of Versailles with a guide, then head back to Paris for lunch, a sightseeing cruise on the Seine River and a coach tour of the City of Lights.